From now until the end of the of the season, we will be tracking the progress of the Yankees with their 1998 World Championship team, which won 114 games. J.A. Happ got the win in his Yankees debut, as he went 6 innings, allowing a run on 3 hits and a walk, with 2 strikeouts. The Yankees got on the board in the bottom of the first when Aaron Hicks hit a two-run home run off the foul pole. Miguel Andujar got an RBI single in the fourth, and they manufactured a pair of runs in the fifth to make it 5-0. David Wells threw a complete game in this one, as he allowed 2 runs on 8 hits and a walk, with 4 strikeouts, to earn the win and improve to 13-2. Seattle got on the board in the bottom of the first when Alex Rodriguez hit a two-run homer, and Wells cruised after that. 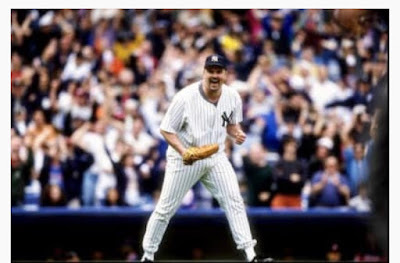 The Yankees responded against Seattle starter Jamie Moyer in the second when Jorge Posada had an RBI single, and in the fourth when Tino Martinez hit a solo homer to tie it at 2. Derek Jeter hit a homer to lead off the fifth, and with Moyer still in there in the eighth, Bernie Williams and Tim Raines each had RBI doubles to make it 5-2. Where they stand: The 2018 Yankees (67-37) remain 10 games off the pace of the 1998 team, which was 77-27 through 104 games.